Incorporating both Alsace's Route des Vins and the picturesque Vosges National Park, this 8-night walking holiday showcases the very best that the region has to offer. Your holiday starts in the heart of the wine country and takes you west through ancient forest and into the Vosges Mountains, straddling the French and German border. Here you'll discover the crumbling ruins of once-mighty hilltop castles and vivid reminders of Europe's wartime past. You'll enjoy idyllic walking through fragrant pine forest and sprawling vineyards as you hop between the storybook villages and towns so typical of the Alsace region - think narrow streets filled with colourful, half-timbered houses and shops selling traditional, local wares (make sure you look out for the delightful Christmas shop in Riquewihr)! Connected by the world-famous Camino de Santiago, the places you visit are home to some of the region's finest wine producers and you'll have plenty of opportunity to stop for tastings. Tearing yourself away from the Route des Vins, you'll head west into the Vosges Mountains, where you'll discover secluded woodland hermitages and the remains of once-grand hilltop castles. Here you have some truly inspiring 'rest day' options. A walk up to the incredible, C12 Chateau du Haut-Koenigsbourg affords mesmerising views across the entire Alsatian Plain as far as the Black Forest, while following the Tete des Faux walking trail you'll pass abandoned WWI fortifications and witness the remains of the former front line between France and Germany. A bit of light relief then as you return to the vineyards and make your way back to idyllic Ammerschwihr. Wine and food go hand-in-hand in the region of Alsace and all of the hotels we've picked for you offer great local cuisine along with superb wine lists! Your hotel in Ammerschwihr is only a short walk from several wine cellars in this typical Alsatian village. 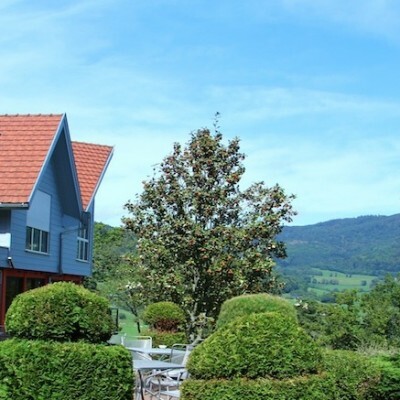 In Thannenkirch your hotel is nestled beautifully at the foot of the Taennchel Mountain, with an indoor swimming pool and spa; while your hilltop hotel in Lapoutroie boasts an impressive restaurant with panoramic views over the Vosges. Peaceful walks mainly through forests, vineyards and meadows but walking boots are strongly advised. Terrain is rocky in places and there are climbs on almost every day but there should be no need of a head for heights. Arrive at your hotel in time for dinner. An opportunity to warm your legs up, today starts with a gentle walk to the neighbouring town of Kaysersberg, one of the finest and fastest growing wine areas in the Alsace with beautiful views of the Vosges. After an easy climb to the remains of the town's C13 chateau, you'll join the world-famous pilgrimage route, the Camino de Santiago, and traverse glorious vineyards to the mediaeval villages of Riquewihr and Ribeauville. It's worth spending some time in both as the former is France's 2nd most beautiful village whilst the latter is home to some of the region's best winemakers, including the Bott Freres - make sure you stop at the wineries for a tasting! Straddling the French and German border, Alsace is a region steeped in tradition with a lot to offer walkers. This holiday incorporates both sides of Alsace to reveal the sun-soaked, vineyard covered Route des Vins as well as the picturesque, atmospheric Vosges National Park. You have several options today but we suggest spending time in the picture-perfect town of Ribeauville, on the Route des Vins. Explore the brightly coloured streets and squares decorated with Renaissance fountains or pay a visit to some of the most respected wineries in the local area including the Maison Trimbach, Domaine Andre Kientzler, Jean Sipp and the Cave de Ribeauville - the oldest wine cooperative in France. 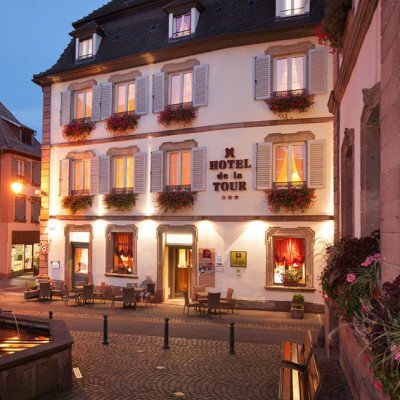 Alternatively, enjoy a walk to the fortified town of Bergheim and discover its fascinating witch-trial past, or perhaps take a bus to Selestat, a city of art, history and exceptional architectural heritage. Today starts with a fairly steep but thoroughly rewarding climb into the Vosges Mountains where you'll find the majestic ruins of the Three Castles of the Lords of Ribeaupierre - Saint-Ulrich, Girsberg and Haut-Ribeaupierre which offer incredible views over Ribeauville and the surrounding plains. Rejoining the Camino de Santiago you'll arrive in the charming wine village of Rodern, renowned for its excellent Pinot Noir wines and an ideal place for a leisurely lunch and spot of tasting. Continue on to Thannenkirch and enjoy the relaxing spa facilities at your hotel. You have the opportunity to explore some of the 60km of walking trails which surround Thannenkirch today, but we highly recommend following the well-marked GR5 walking path up to the incredible Chateau du Haut-Koenigsbourg. It's easy to get lost in this imposing chateau which is perfectly located above the Alsatian plains, with the Route des Vins and Germany to the east, and the Vosges Mountains to the west. For something a little less strenuous, you could always spend the day relaxing in your hotel spa. After breakfast, we'll transfer you (25 mins) to the start of your walk in Aubure - you might want to pick up some supplies in Thannenkirch or Aubure as there are plenty of scenic picnic spots on today's walk! Descending on ancient forest paths you'll enjoy superb views towards Hachimette and Lapoutroie, as you make your way to Freland, home to the Maison du Pays Welche museum, a fascinating insight into the history, traditions and customs of the local people. Quiet lanes and footpaths lead you to the idyllic mountain village of Lapoutroie and your hotel, Les Alisiers, where you'll find a wonderful restaurant with panoramic views over the Vosges! Today's optional walk is a memorable one. You'll follow the Tete des Faux walking trail through atmospheric forest, passing old WWI bunkers and infirmaries now reclaimed by nature, to the remains of the front line between France and Germany. It was atop the summit of the Tete des Faux that the two sides engaged in a bloody stalemate just 30 metres from each other during the First World War - the graveyards for each are currently listed as national historical monuments. You may wish to walk down to Le Bonhomme for a spot of lunch afterwards, before walking back to Lapoutroie. It's all about the idyllic scenery today, starting with an undulating woodland walk down to the little village of Orbey, nestled in the picturesque Vallee de Kaysersberg - here you'll find several cafes and shops where you can stock up on provisions for the day! Atmospheric woodland and pretty meadows take you to the little mountain village of Labaroche and on to Trois-Epis, the perfect place to pick up some traditional Alsatian pastries. Perhaps enjoy them with a superb view over the Vosges, after a walk up to the Galtz Monument just outside the village! Don't miss the striking hilltop remains of the Chateau du Wineck in Katzenthal before winding your way through the vineyards back to Ammerschwihr; how about a spot of wine-tasting to celebrate your walking achievements? 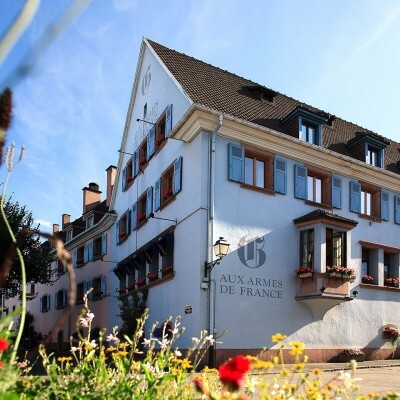 Here you stay at the traditional Aux Armes de France hotel in the centre of the village of Ammerschwihr. With just 10 rooms (all with ensuite), it's a small but very much family affair, father Pierre originally founded the hotel although his son, Philippe, has now taken over the day to day running of the hotel. The hotel's restaurant is of some repute locally and in good weather, their excellent cuisine is served on the flower bedecked terrace. This 17th Century house has been in the Alt family since 1848, originally used in their winery business, and was opened as a hotel by Michel et Francoise Alt in 1978. Located right in the centre of Ribeauville, facing the Tour des Bouchers, Ribeauville's famous tower. The hotel has 31 individually styled comfortable rooms and there is a spa with sauna, turkish bath and jacuzzi in which to unwind. Opened in 1929 and situated in the Ballons des Vosges Regional Park, the Clos des Sources Hotel & Spa is conveniently located in the centre of the small village of Thannenkirch. Recently renovated, the hotel's rooms are presented in the style of a chalet and are decorated in a rustic-chic fashion using natural materials. The high quality restaurant provides traditional Alsatian cuisine as well as other French inspired dishes and breakfast is a well-stocked continental style buffet. 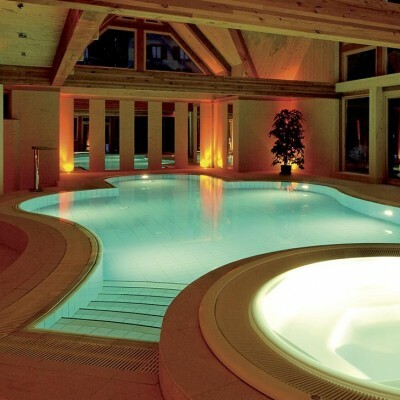 Of particular note for guests is the impressive swimming pool and spa, recently completed, which offers such things as hot-tub, steam room and saunas, as well as a range of additional treatments at extra cost. Note: there are no twin-bedded rooms at this hotel however 'Austrian Twins' can be created - 2 separate mattresses and covers in the same king size bed frame. Sitting on a hillside overlooking the village of Lapoutroie is the small, modern Hotel Les Alisiers. Thanks to the enviable location, the impressive restaurant and several of the rooms offer panoramic views of the surrounding hills and countryside. Once a farm, the hotel was recently renovated and now has the feel of an up market chalet with each room furnished in a warm traditional style with lots of wood. Hosts Caroline and Mathias offer a friendly welcome and their restaurant provides a fine selection of contemporary regional cuisine from its ever changing menu as well as an excellent wine list. 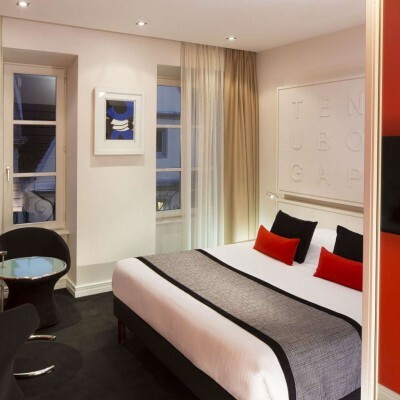 This is a brilliantly situated hotel in a quiet side street just off the lively Place Gutenberg and a stone's throw from the Cathedrale de Notre Dame. The 42 rooms are a good size and individual in style. All rooms are en-suite, with hairdryer, flat screen television and free Internet access in each room. There is no bar or restaurant, except for the little breakfast room next to reception; however, you have a good choice of places to eat and drink on right on your doorstep. Transfers included from Colmar train station at 14:00. This was my second Headwater holiday and once again it was fantastic. We loved the variety of hotels - each one unique but very high quality and comfortable. Hannah was extremely welcoming and friendly and always on hand if needed. The walks were a lovely mix and would definitely recommend doing the two extra walks on rest days as the Château Haut-Kœnigsbourg and particularly the Tete des Faux were highlights for us. Some of the climbs were a little challenging in the heat but nothing more than expected for the level of holiday. Would definitely recommend this holiday! We couldn't fault any aspect of the accommodation. The overall housekeeping arrangements were excellent, and the catering was superb throughout. Hannah's positive approach and organisational skills made for a carefree holiday. The routes were challenging, but we were made aware of this when we booked, so it didn't come as a surprise. Alsace is a beautiful and unspoilt part of France, and the perfect destination for a walking holiday of this nature. A very interesting place to visit. Border country is always interesting and this one particularly so in view of the history. An added interest was being in an area where growing grapes was so important. The walks had plenty of variety and we saw what made this part of France very different. An added bonus was great weather. The efficiency of the organisation and the professionalism of the staff was evident right from the start of the booking process, making this one of the easiest and least stressful holidays we have ever planned. The walking itself provided a constantly-changing set of scenery and the notes were absolutely spot-on; in particular, this was due to the efforts of our rep, who went through the notes with us on arrival and highlighted any sections of particular importance to make sure we did not go wrong. The hotels were all of high standard, although Les Alisiers and Hotel Mouton were particular highlights for us due to the friendliness of the staff and the exceptional quality of the food. The view from Les Alisiers were outstanding, and really added to the experience when enjoyed over mealtimes. Our rep, Hannah Godwin, was hugely enthusiastic from the start, and exuded the genuine love she has for the region in an infectious manner - we couldn't have asked fora better introduction to the holiday than the one she provided. Her introductary talk was incredibly helpful, not only regarding routes, but also in terms of the additional suggestions she made that allowed us to experience elements that we would otherwise have missed. She was unfailingly prompt and extremely professional, making it very clear that she was always available if we encountered any problems whatsoever; this left us free to relax and enjoy ourseleves. We believe that she is a genuine asset to your company and a fantastic ambassador for the region. We would also like to mention Dionne Sidlauskas, who was extremely helpful during our selection of the holiday and made the booking process very smooth and easy indeed. A challenging walk but extremely interesting variety of scenery, history, culture and terrain. Hannah is full of enthusiasm and was very helpful in her suggestions for the "off days". she had researched the options thoroughly and we really enjoyed the visits we made on those days. We will be back with you again. Excellent holiday with superb support from our Rep, Hannah. Walks varied although quite a lot of forest walks.nHotels excellent. Living where we are we required information re which airport it landed in, could we do other things ie stay in city we landed for a night before travelling on to holiday etc. Having spoke to two of the reps, which did not come back to me I tried email. This led to corresponding with Megan Wyatt. Came back next day with all the questions i ask about near enough sorted out. She told me what headwater could do for us, sorted out dates, which airport would be best, what they could not do for us.. Having now agreed a plan of the holiday with slight changes to first request she came back the next day with everything sorted out and prices. Signed there an then. As for the time between signing and flying head office kept us up to date with everything. Had one query before flying to Basel as they said that we should go into the French departure and not the Swiss however as we were staying the night in Basel. E- mailed them to see if they were correct. They came back within two days to advise me that it was the Swiss side i should be leaving on. Having arrived in Colmar the next day, with train timetable on the ball met Hannah Goodwin. She could not do enough to help us, however stayed away when not required. As for the accomadation i cannot say enough about the food and helpfulness of the staff in all hotels. This was an excellent two boot walking holiday with really good walks with the additional benefit of places to see as well including chateaux, villages and WW1 historical sites plus excellent food and wine/beer. The local representative was extremely helpful. Lovely area with varied walking and historical interest. Also picturesque small towns and villages. Good standard of hotels. An excellent way to experience France, with beautiful views, comfortable hotels and good food. Lovely area of France with variety of walks in differing landscapes. A great holiday if you like good food and wine but the walking was slightly disappointing. Although the views were sometimes good, there was too much walking on the roads. Great contrasts in locations so holiday very accurately titled! The balance of vineyard and forest was good. The towns and villages and castle were varied and interesting. Every two days from 11th May 2019 to 12th Oct 2019, for 8 nights. All dates are subject to availability, please contact us to check. Due to the tailor-made nature of our holidays, we need a little more information in order for us to check availability for Contrasts of Alsace and The Vosges Walk. Simply complete the form below and a member of our sales team will contact you (when it's most convenient for you) to provide availability information, travel options and an accurate price. Of course there's no obligation, but if you do wish to proceed with a booking they will be on-hand to assist you throughout the process.